Firstly, thanks for being with us at the start…whether contributing, or joining out of curiosity. You’ll have noticed that we’ve been making changes; the site is actually a work in progress, and we’re always trying to look for better ways to organise it…to make it easier and more attractive to use. Some of these tweaks will be minor, others will change the design, or add options. If you have specific ideas about what you’d like to see or do on the site, or you have problems with it, we’d welcome your emails. Secondly, the driving force behind the project has been to encourage original creative responses to the Bible, so we’re re-writing the guidelines to make this clearer. We believe that poetry and narratives (whether drama, story, or new liturgy) should stand on their own, so if you’ve included clip art or other illustrations, could you re-submit them again, without the clip art, please, and in a plain black text font. If you have illustrated your work, you will find you get more viewers if the illustrations are submitted separately, but tagged the same. Please consider contributing more work, and encouraging others to join. We have had tremendously good feedback from Bible organisations and Christian art groups, but Rockpool isn’t just for ‘Christian’ art; it’s for everyone working with Bible imagery. Thank you once again, and we look forward to seeing your new work. 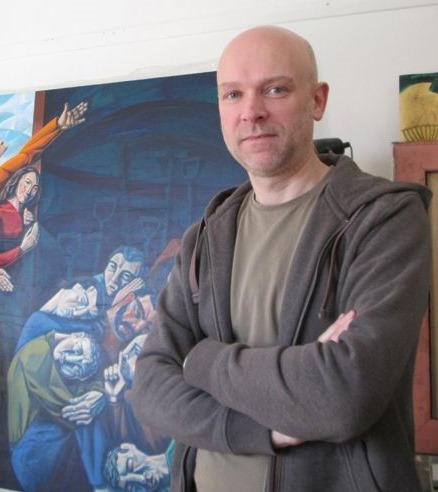 For the first entry in our series of contributor profiles we contacted Michael Cook, one of the early adopters of the Rockpool project website and painter of such works as “Parable”, “Jacob Wrestling the Angel” and the stunning “Gethsemane” . Hear a recent interview (10/02/2013) that Shaun Turner did for the Blair Jacobs Sunday Morning show on BBC Radio Humberside, talking about our Rockpool Bible Project. The website is growing, more artists are joining and more work is being uploaded. It’s been two weeks since we started sending out tentative emails and invitations for contributions and we’ve been pleased with the response so far. Well, we’ve finally uploaded the beta version of the Rockpool Project and whilst there are a lot of bits to polish, modify and change we are sure you’ll get the idea. Head on over to www.rockpoolproject.com and give us some feedback on issues, usability etc. We ate looking for a logo so if you feel inspired and want the fame/kudos of having your work seen across the web then please do drop us a line and we’ll outline the brief.